Cathodic Protection (CP) is one of the most widely used methods to control external corrosion in the oil and gas industry. It is a technique that has been used extensively over the years to reduce the cost effects of corrosion. The key to a successful CP system is understanding the environmental conditions in which the CP system is protecting, the proper installation of required equipment, as well as the ability to monitor and evaluate the overall effectiveness of the CP system. Prior to designing any Cathodic Protection System, Rysco Corrosion Services and the client must thoroughly understand the environmental conditions and the structure to be protected. This key step is often overlooked but is the most effective and economical way in which to design a successful CP system. Our experts have a vast knowledge of emerging technologies which can be incorporated into both new and aging infrastructures to protect against external corrosion. Each fully customizable design includes comprehensive specifications and drawings to meet each individual client’s requirements. Upon completion of the design, an extensive CP system review is then performed to ensure the integrity of the program. Once the system design review has been approved, Rysco’s trained professionals will effectively plan to execute field work in a timely, cost effective manner. Our project managers will work alongside with clients or with local contractors to ensure all aspects of the design are being met. Installation of equipment, test posts, or bonds will be confirmed, labelled, and cross-referenced to the detailed design drawings. All updated information will be documented for historical reference. Now that the Cathodic Protection System has been installed, routine services/surveys should be completed to monitor the overall effectiveness of the CP system. At Rysco Corrosion Services, we can provide an efficient data management system which is fully customizable to the end user. This will typically incorporate GIS mapping, rectifier input/output, current source mapping, as well as generate corrosion Key Performance Indicators (KPI’s) and compliance pass/fail reports.. Annual adjustive surveys are a method outlined by NACE International in order to evaluate the effectiveness of the cathodic protection system. 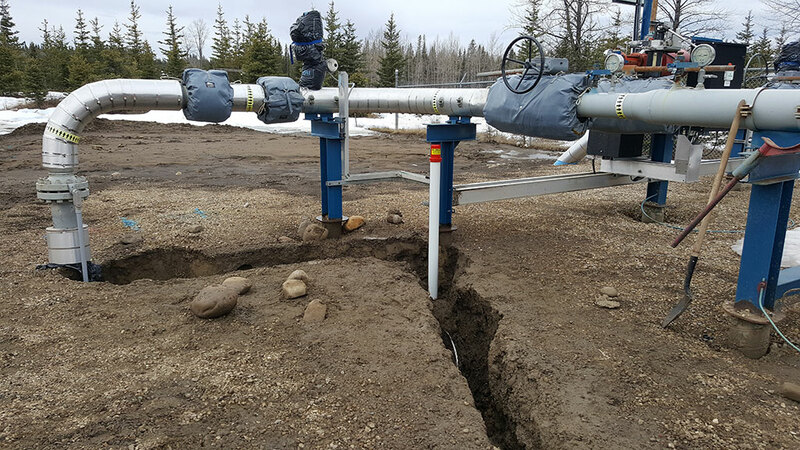 Annual surveys are an important maintenance function as there can be elements of the cathodic protection system that have changed from year to year. These elements can include new metallic infrastructure, third party infrastructure, or optimization of impressed current systems. The two main activities involved in an annual adjustive survey are the inspection of the sacrificial and impressed current inputs and the collection of the resultant structure-to-soil potentials on metallic structures electrically continuous with the infrastructure. Prior to completion of an annual adjustive survey, Rysco Corrosion Services staff map all available historical survey data to pipeline maps utilizing Geographical Information System (GIS) techniques. 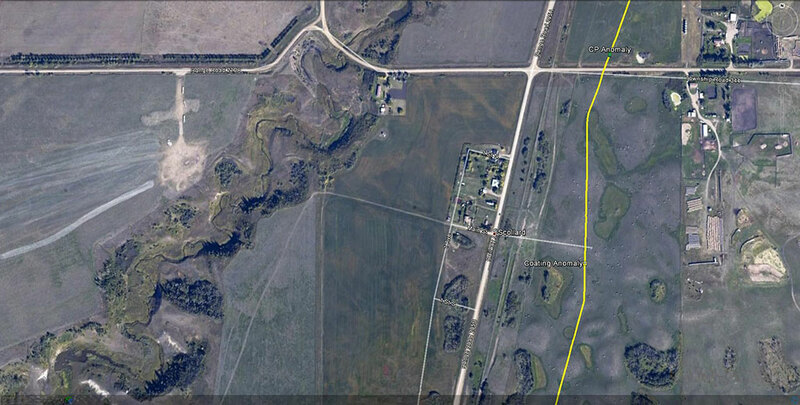 Evaluation of historical data in this method allows for validation and verification of prior surveys, by Rysco crews. The intent of this step is to address any perceived obstacles that may arise, prior to mobilization. 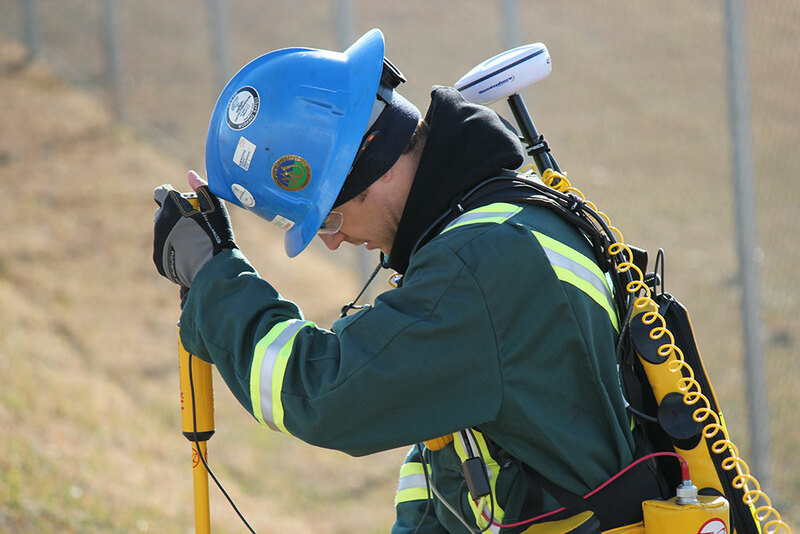 Annual adjustive surveys are completed using recognized NACE techniques for the evaluation of on/off, pipe-to-soil potentials, bonds, isolation, rectifier, sacrificial anodes, test posts, interference test posts, and other associated cathodic protection stations. Rysco Corrosion Services crews utilize best in class technology for the efficient completion of annual adjustive surveys. This includes access to relevant mapping (as prepared in the Pre-job Survey), tablets, and data collection techniques. This allows for excellent survey repeatability, accuracy, and timeliness. Upon completion of the annual adjustive survey, all the collected data is entered into the Pre-job Survey format for analysis. Reports are provided in digital form and are archived in an online source along with optional interactive GIS files containing the survey data. Annual subscriptions are required for interactive online survey data. Annual reporting formats can be tailored to each end user client as requested. 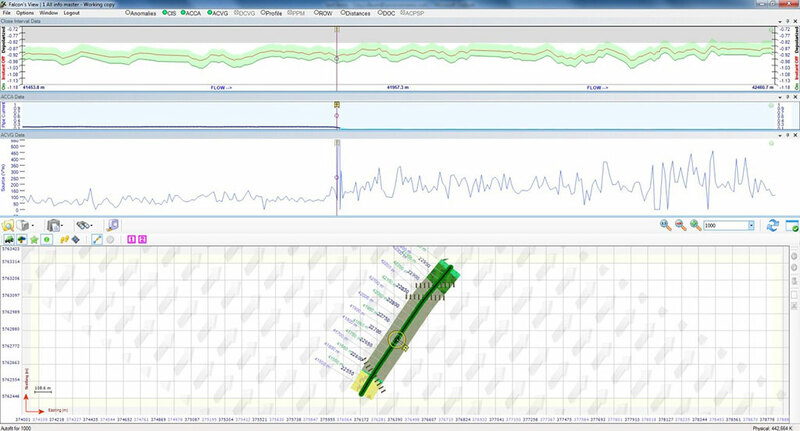 Close Interval Potential Surveys can be used to evaluate the effectiveness of a Cathodic Protection system applied to a buried pipeline. As the name indicates, the survey is an evaluation of the soil to pipe potentials at close intervals (typically 3m or less) along the pipeline. The CIPS survey can also indicate areas affected by interferences and coating defects. Rysco Corrosion Services will conduct CIPS surveys with the aid of rectifier interrupters to evaluate on/off potentials along the pipeline right of way. Rysco Corrosion Services recommends the CIPS evaluation to be used in conjunction with ACCA/ACVG coating evaluations because the CIPS survey will identify adequate CP system protection at any identified anomalies. 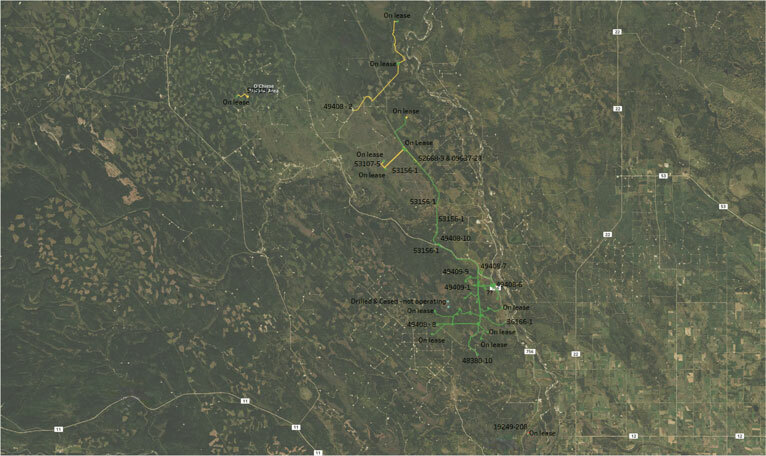 Prior to completion of a Close Interval Potential Survey, Rysco Corrosion Services’ staff map all available historical survey data to pipeline maps utilizing GIS techniques. Evaluation of historical data in this method allows for validation and verification of any prior surveys, prior surveys before mobilization of Rysco crews. Upon completion of the CIPS survey, all collected data is then exported into proprietary software. This data is then reviewed by a Rysco technician and reported back to the client. These reports are customizable and typically includes GIS mapping, field photos, and graphs indicating where deficiencies/defects may be located. 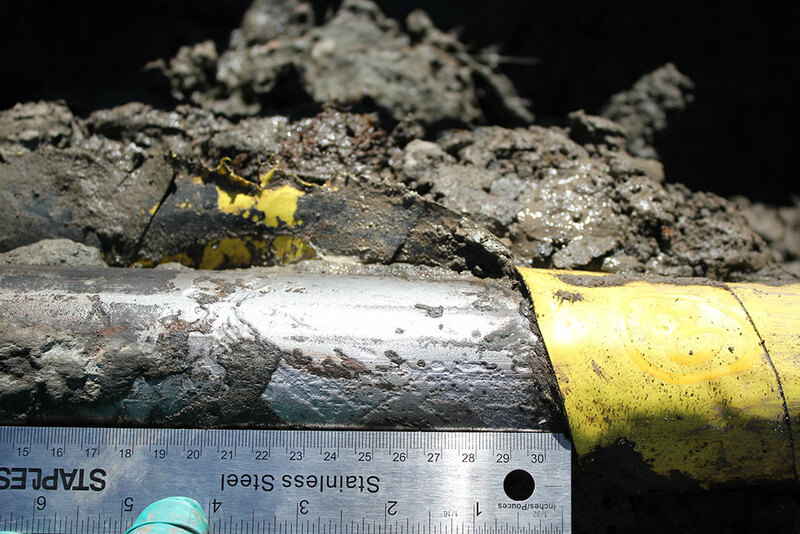 External coating indirect inspections are conducted on buried pipeline to measure and assess the protective coating on the outside of the pipeline, and to pinpoint any coating anomaly indications that may be indicative of exposed metal. Several complimentary methods are used to evaluate the external coating, each with its own advantages and disadvantages. By utilizing several methods, the interferences between each method can be eliminated, providing confidence in the measured anomalies. The equipment and procedures employed by Rysco Corrosion Services are in full compliance and support of Indirect Inspection Methods per ANSI/NACE SP0502-2010 ‘Standard Practice for Pipeline External Corrosion Direct Assessment Methodology’. The ACCA method employed by Rysco Corrosion Services is used to identify coating anomalies on buried pipelines by measuring the strength of an electromagnetic field around the pipe occurring because of an applied alternating current signal. When an AC signal flows along a straight conductor it will produce a symmetrical magnetic field. Electromagnetic induction is used to detect and measure the intensity of the signal, and the resultant pipe current is calculated. Where no coating anomalies exist, the current will attenuate at a constant rate. The rate of attenuation will depend on the coating properties. A significant change in the current attenuation rate can indicate coating anomalies. 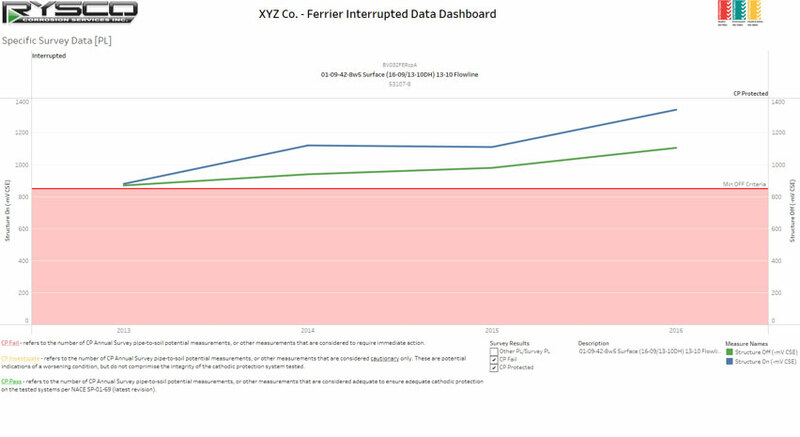 During analysis of the logged data along a buried pipeline, Rysco Corrosion Services will compare the gathered ACCA data to the complimentary ACVG data to validate any suspected anomalies. As ACCA data can be influenced by geometrical effects (distance to pipe, bends, turns, vertical rises), comparison to an alternate method is essential. 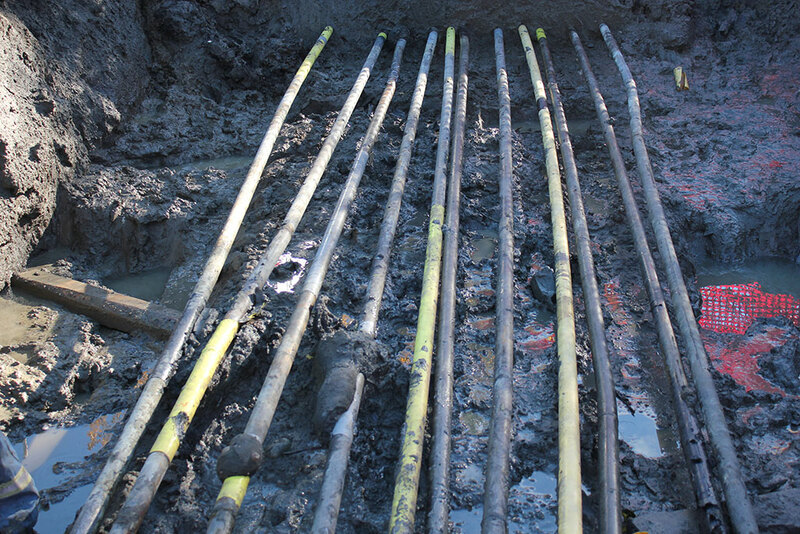 The ACVG method employed by Rysco Corrosion Services is a variation of the Pearson technique for detecting coating faults on buried pipelines. The technique involves the induction of an AC current on the pipeline, which is then assessed by two technicians wearing metal cleats. The metal cleats provide electrical contact points with the ground, both over the pipeline and at a 3m distance perpendicular to the pipeline. The voltage gradient is then measured between the two contact points and adjusted for relative distance from the transmitter. A coating fault will result in a higher voltage gradient between the over the pipeline contact and the 3m contact than a location where there is no coating fault. The method employed by Rysco Corrosion Services is considered a modified Pearson technique due to the elimination of audible tones and interpretation of acoustic data. Measurement in the modified technique is considerably more analytical due to the use of electronic measurement and the recording of actual AC voltage gradient magnitudes in millivolts (mV). 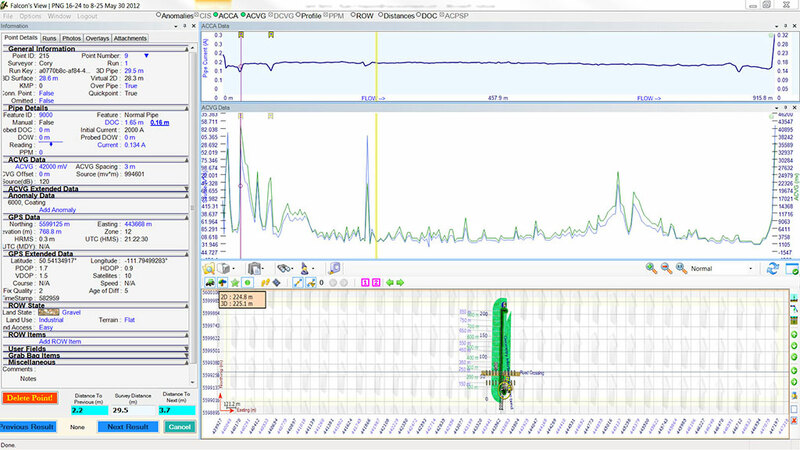 During analysis of the data, Rysco Corrosion Services will look for increases in the normalized mV measurement to indicate voltage leakage from the pipeline. Interferences from the poor contact are confirmed and correlated to ACCA data to indicate coating anomalies. Right of Way (ROW) Inventories can also be recorded and include test stations, pipeline markers, signage, crossings, roads, and many other types of inventory items. Typical land use classifications include: Arable/Cropland, Native Grassland, Pastureland, Landscaped, Brush/Woodlands, Surfaced, Swap, Primarily Underwater, Sandy, and Rocky. CSA Z662 requires that owners of buried assets such as pipelines maintain a minimum level of ground cover, based on the land use above the pipeline. Rysco Corrosion Services can provide survey results for buried pipeline in support of ECDA practices and to ensure compliance with CSA Z662 requirements. DOC measurements are an important factor for asset integrity, especially at creek/river crossings where there may be erosion along the banks. 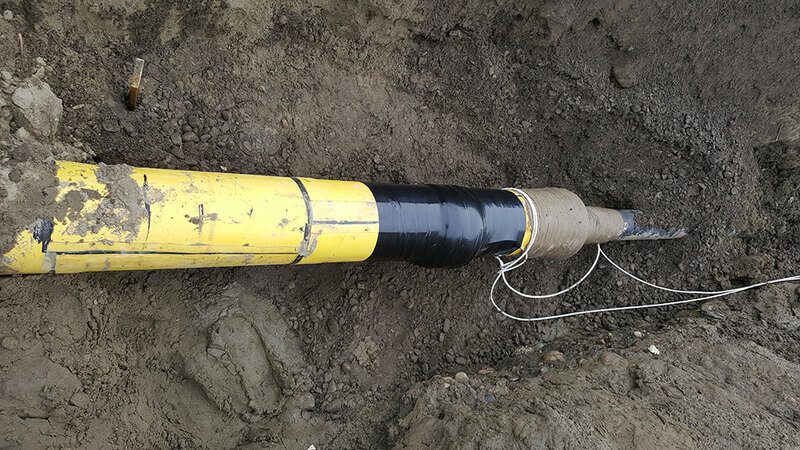 During the locate procedure for identification of a buried pipeline, Rysco Corrosion Services is able to identify the GPS center-line of the buried pipeline, along with a determination of the Depth of Cover (DOC) corrected for the diameter of the pipeline. While logging the pipeline location, Rysco Corrosion Services technicians record the land use for correlation with the required Depth of Cover. Depth of Water can also be determined in the same way, but with the additional use of SONAR for depth determination.